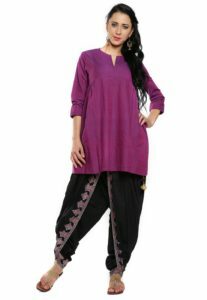 Among the vast variety of Indian ethnic top wear for women, cotton tunic tops are the best-loved casual outfits. These are quintessential summer tops; cool, comfortable and stylish. Made using natural fiber namely organic cotton, a tunic can be cut in a variety of ways and with a variety of designs. This makes cotton tunics not only convenient to wear but also uniquely casual yet classy. 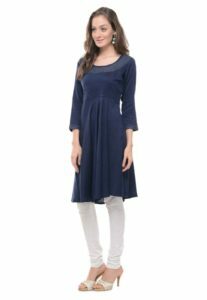 Indian designers as well as international design houses have further experimented and innovated with the clothing item to form a breezy and casual cotton tunic dress. 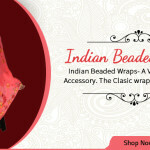 These top-wear items are popular with Indian women between the ages of 15 and 35. However, there is no limit to the reach of these items which can be worn by women across all demographics. The beauty of Indian ethnic fashion especially for top-wear items is that it is not bound by a limited range of colors or designs. Cotton kurtis are shorter versions of cotton kurtas, which are in turn the Indian version of the ‘tunic’, a Greek-inspired garment. 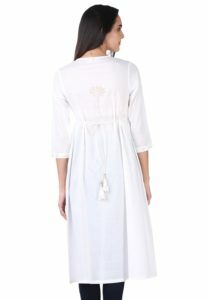 Tunics are the preferred clothing item of a lot of women, especially young girls and working professionals. 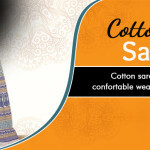 Since cotton is a light material that does not absorb heat, it is preferred by the larger Indian populace. 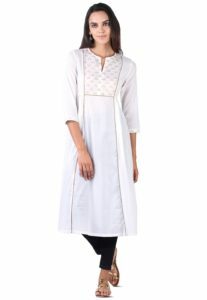 For women, these cotton kurtas and cotton kurtis are ideal because as a material, cotton can be dyed with any color thus expanding the number of choices available as well as the variety of designs. Moreover, they allow for free movement of the arms while also complimenting the curves of an Indian woman. Voile is another fabric that has become popular in the creation of ethnic Indian tops. It is a semi-transparent variant of cotton, meant to be worn over another layer or fabric. 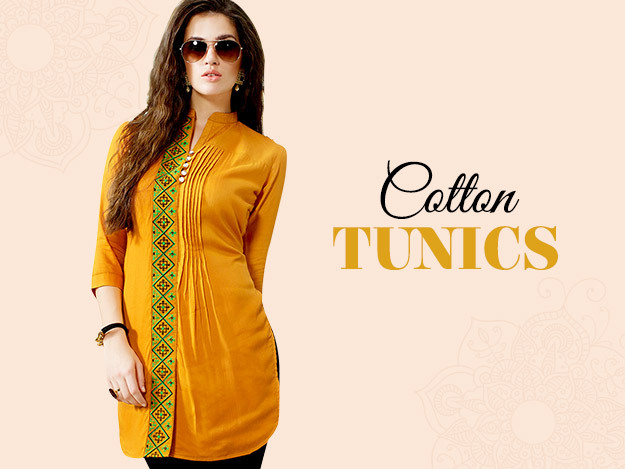 Cotton voile tunics are popular throughout the country and have been in vogue since the Summer 2014 collection. Tunics are a great addition to a woman’s summer wardrobe. Moreover, they are readily available in all marketplaces. 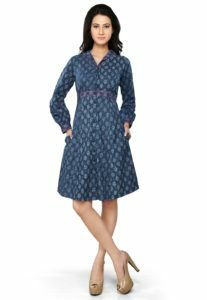 There are any number of patterns and prints that can enhance the look of a cotton tunic, right from chikankari work to paisley print, animal print, floral print, tie and dye and much more. The variety in the styling of the tops is a result of the fusion of Indian and Western styles which yields many new and interesting designs. Angrakha and kurta style tunics lend an Indian look to the outfit, while front open shirt style leans more towards the Western side of the scale. Other forms of popular styling include having a drawstring around the hips, anarkali style tunics and roll-up sleeves on the tunics. 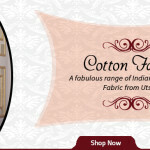 Another factor that appeals to consumers across the globe is the affordability of cotton tunic tops for ladies. The pricing of the product, although varying from store to store, is largely affordable without compromises on the styling of the product. However, for more reliable stitching, quality fabric and versatility in design, trusted brands, boutiques and online stores are the preferred shopping destinations of women everywhere. It is common practice for women to shop by season. This necessarily means that every year there is a pile of clothes in every woman’s closet that reads ‘Discard’ or ‘Recycle’ or ‘Donate’. Very few clothing items from the previous year make it into the ‘Reuse’ pile and tunics can generally be counted among them. 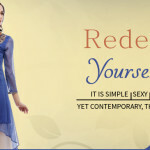 Here are certain must-have tunics for a summer wardrobe that can be carried forward for as long as the product lasts; and when it runs out one can go out and buy the same item all over again because these never go out of style. The perfect top wear over blue or black jeans with a long necklace and oversized sunglasses, this blouse is great for a relaxing summer day. Alternative accessories for this clothing item can include chunky bracelets and large stone rings. Even Indian earrings can be paired with it, according to the personal style of the wearer. A cotton dress is the natural choice for women on a warm summer day. 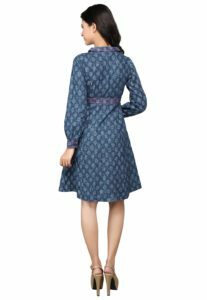 Whether it is to spend a day at the mall or out with friends, a casual party or a day at work, a tunic dress made of cotton can work wonders. It can be paired off with flat sandals, high-heel slippers or even colorful jutis. Last but certainly not the least, cotton knit tunic tops are tunics that are made of knitted cotton i.e. the material that t-shirts are made of. Allowing free movement and freedom of accessorizing, these tops can be worn over all kinds of bottom-wear like jeans, 3/4ths, harem pants, skirts, palazzo pants, jeggings and leggings.